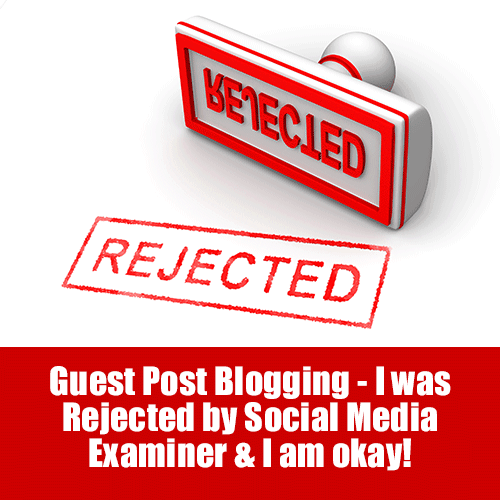 Guest Post Blogging - I was rejected by Social Media Examiner and I am okay! You are here: Home / authority marketing / Guest Post Blogging – I was rejected by Social Media Examiner and I am okay! Guest Post Blogging – I was rejected by Social Media Examiner and I am okay! Guest post blogging is the new black. Finding authority sites that will publish your works is as old as the hills, but has turned into one of the only true-blue ways to get backlinks that Google likes. First Off, What Is Guest Post Blogging? This is where you find a site that would have comparable materials to yours and offer to write a post. Sites like the Social Media Examiner even have a submission form where they review your current work and then let you know whether or not you will be a good fit. I was super excited the day they let me know they would consider one of my articles! Next you submit (or they tell you) a number of different titles that would be interesting to their readers and write a post for their review. I worked with an awesome editor, Cindy King who seemed a little hesitant about my titles but in the end said the one about contacting authorities in the marketplace might work. Okay, I should have seen this coming a mile away. While I do read and enjoy Social Media Examiner almost every day, I didn’t really scope out that they are more of a technical “how to” site than suits my style of writing. Also, they have very high end techy people who are excited about sharing the details of what to do, where I am more of a how and why kind of gal. It was not a good fit so I stopped trying to make my round peg fit in their square hole. There is nothing wrong with me and nothing wrong with them, just we were not a good fit! So not only should you make sure they are in your industry, you should make sure that your writing style fits their publishing style. I am thankful for the opportunity they gave me to try, but my time is better served by finding sites that do fit how I write and approaching them instead of trying to make my whacky bits fit their serious bits. A couple of things…first off, if you are techy and involved in social media, I would recommend you sign up to see if you could write for the Social Media Examiner. They have a high class operation that is a pleasure to work with. Second off, if you would like to read the article they rejected (which is VERY good if I do say so myself) it is below! We have all heard it before, the way to increase your SEO and Social Media efforts is to piggyback on the authority of thought leaders in your industry. That is great for you and can only serve to help your efforts, but what is in it for them? Experts in industry have spent a lot of time or energy becoming experts. They have written best selling books or gotten super advanced degrees in their field. They have spent years building up an audience of rabid fans and the outward manifestation of their hard work is the fact that they now “important” and everyone wants their time or attention. But what would cause Chris (or any other thought leader) to notice you? I know, you could send them a long email about your product and how it would be great for his readers! In it, you could enumerate the ways that your product will benefit his audience and how much money he could make if he just told everyone about it. Sigh. Even on my small scale of notoriety, I am astounded about how many people will approach me asking me to use my authority to help them. When you go about it this way, not only does it make you look ridiculous, but you may have blown a real opportunity to make a meaningful connection! So exactly how should you connect with thought leaders in your industry? Brilliant! I want to write for SME and they say to get quotes….I should ask some experts. Hmmmm, let’s try some best selling authors in the marketing field. Who do I know? or more correctly, who knows me enough to take time away from their busy day to help me? The first person I thought of was Chris Brogan (of course), a New York Times Bestselling author of books like The Impact Equation and Trust Agents. Chris has a newsletter that I read weekly on Sundays and email him back when appropriate. I also share his blog posts on my social media when I think they will help my audience, using the @chrisbrogan method of letting him know I shared it. “Often, what happens when people approach me is they come from what they need, what they want, what they hope to get, and usually, with very little to offer me or my community in return. They want my time, my thoughts, and my effort, but without really giving me much of a reason to participate. The people who get my attention tend to have actually read the last handful of things I posted (not the most recent because that’s an easy fake), don’t bother lavishing me with praise, do give me really simple directions for what they need, and do make the project easy to do. It’s not that we’re prima donnas and that we have gentle sensibilities. It’s that our inbox is full to the top with people asking for something. But if I can answer easily, or can participate without a ton of effort, I’m usually game. Read their writings – I know this seems simple, but many authorities are AUTHORS, the whole point of their being is to have people read their works. Buy their books and review them on Amazon – bonus points if you write a blog post about the book and point it to their Amazon sales page without an affiliate link! Sign up for their newsletters and reply when there is something that interests you. Another one of my favorites is Gary Vaynerchuk of Crush It and The Thank You Economy fame. Gary has a HUGE social network and I know that he cannot possibly see everything that everyone is saying about him, but he tries. I have met Gary in person twice, first at a small little event he gave before he was famous and then at a local book signing when his second book came out. Both times I introduced myself as Taradactyl (my twitter handle) and he graciously said he recognized me. I did not get a response back from Gary for this article, but that is alright. I am sure that he is busy with writing books, appearing on television and running his social media marketing empire. What he has done in the past is ask for my help (by pre-buying a number of his books) in return for the promise of something cool. Nothing more specific than that, just something cool. What I got was a box full of samples, coupons, marketing gizmos and special offers just for “friends of Gary”. It was an amazing surprise and one that cemented even further my liking of him. Watch for them to have national appearances – just recently @GaryVee (his twitter handle) shared that he was going to be on Piers Morgan. I Tivo-ed it and was able to reference that in my request to him! If there are videos from their TV appearance, share them with your networks. Go to their book signings – again with the Author thing, they need people to show up! When they do have an event, share it with your social network – bonus points if you Instagram a picture of you with them from the event. Set up a Twitter list or a Facebook list so you can check daily to see if they have a new offer or something of theirs that you can share. It is really easy to think that a personality has enough other people to help that you don’t need to jump in. Before his last series of books came out, Seth Godin did a Kickstarter.com campaign to raise money and to show his publisher there was support for a book that he intended to write. His goal was to raise $40,000 and ultimately what was raised was considerably more than that. One of the best parts was the opportunity to support Seth and get a HUGE book of over a quarter million words of his blog posts printed out. From the Kickstarter site, it looks like just over 2,000 people took advantage of getting the “big book”. Now that it is here and popular, more and more people are wanting to get one. This is the key, support them before it is cool to, not after everyone else has jumped on the bandwagon! Show excitement about their work – this is a great video done by a fan about opening Seth’s book (Rex Williams, the man who made the video has almost 5,000 views on this video and personal links from Seth from his Squidoo lens). Buy what you can afford – someone without the means to purchase one of the big Kickstarter campaigns, could have accomplished a similar level of enthusiasm by buying the smaller book, doing a YouTube, reviewing it on Amazon, posting about it on their blog and generally blanketing the airwaves with it. Pay it forward before you attend one of their events. We are attending a conference that Jay Baer will be speaking at. We have contacted him and asked his best social media links to include in an unofficial guidebook we are making and he was happy to share the best ones with us. – update since I wrote this, we also wrote a post The Trouble With Email Marketing – A Shoutout To Jay Baer and Chris Brogan after seeing his keynote and he commented! YAY!! Isn’t This A Little Mercenary? With all the setting up Twitter lists, subscribing on Facebook, sharing on the Google+, doesn’t it ever feel a little icky stalking your target influencers? Two things to think about here, 1) if you are working in an industry you love, they are probably on your radar anyways and 2) this is not about figuring out what they can do for you, it is about supporting them! Yes, there is a point when you might ask them for something, but I have found more often than not, they ask me for something. Of course I answered Gary and said I would buy some books to share and would be happy to evangelize what he is doing. Did that cause an equation to happen [answers a mass call on Facebook] + [requests a quote for article] = [gets the quote]. Do these tactics always work? Nope, this time GaryVee was too busy to help. But next time he might not be, or he might have an opportunity that is too small that he could recommend me or my company for or any number of other good things that could happen because I am being nice. If you think more about helping others than what they can do for you, oftentimes they will come through in the end! What is your best tip for getting thought leaders in your industry to notice you?